A break from the many holiday related posts and photos! OK these are slightly holiday related because I bought them in Italy but I'm sure my crochet followers won't mind! 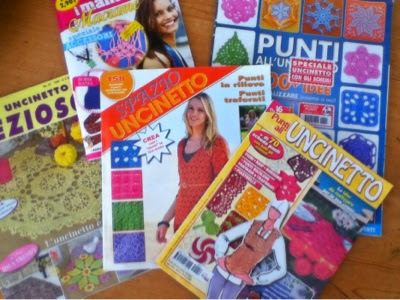 Uncinetto! 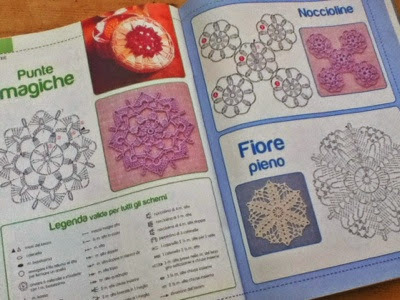 Italian for crochet! There's a mixed bag here. 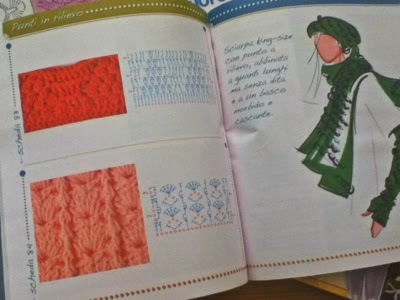 Two of the larger magazines have a lot of stitches for crochet fabric (fourth photo down). I thought they might all be in my crochet stitch bible but it seems not. I love the fashion illustrations scattered thoughout. I've google translated some of the captions and it seems that they are suggestions for what you can do with the stitches rather than specific patterns. I like this approach, it encourages you to be creative. There are some specific patterns too. I've swatched one of the crochet stitch patterns and the diagram symbols were identical to the ones we'd use in the UK, that is to say that my swatch came out like the picture! 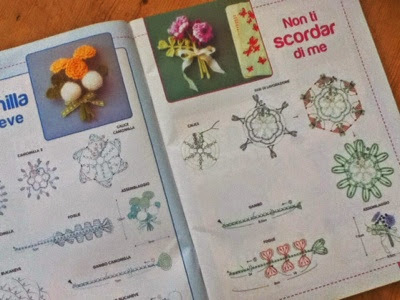 The large blue magazine has intricate flowers at the beginning which would make great brooches, lots of motifs, edgings, fabric stitch patterns and some item patterns too. A really good value magazine for less than five euros. I can't wait to try out some of the motifs. One of the magazines is mainly filet crochet and fine table wares. Doilies and mats etc. I wanted one of these as a contrast to the others. It's fascinating to look at but it remains to be seen whether I can crochet that finely without hand ache! I threw a macrame magazine into the selection. It's my guilty secret, macrame. I'm sure I've logged it in my blog somewhere before, how I got thrown out of a sewing class because I was so terrible at it. The teacher plonked me in a corner with a macrame pamphlet and a large cone of string. Boy was I happy with that punishment! 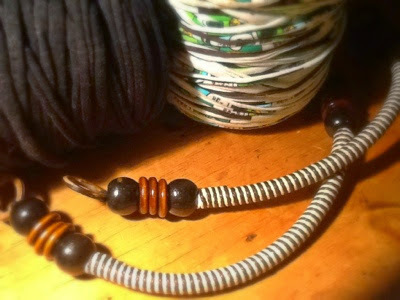 Such a useful skill macrame. I've made light pulls, bucket handles, jewellery, plant hangers... long before it all became fashionable again. It may well be a challenge to follow the instructions but there are plenty of photographs and I have prior knowledge of the techniques. 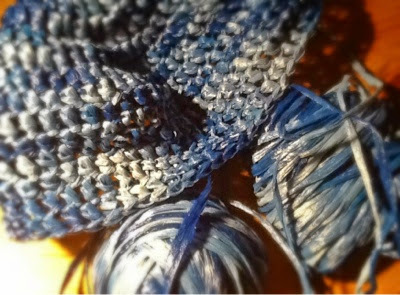 The second to last photo shows my raffia hat in progress. I haven't captured the colour correctly at all. Hopefully a photo of the finished thing in proper day light will do that. It's easy enough to crochet with. Held double I think I could have made a nice basket instead. Finally, the purchases made from a market in Rome. Two large balls of t shirt yarn and some bag handles. By this stage in the holiday we were getting used to the haggling and getting better at it too. M did the deal for me and the yarn and two handles cost less than £12. I was quite happy with that as bag handles alone can be pricey in the uk and also hoopla yarn or similar is £8 plus per cone. One of the balls is charcoal grey and the other is cartoon strips. I'm not sure what to make with them yet. Bags and rugs seem popular choices. The Rome market was our favourite. It was a mixture of clothes and goods. J was able to get various Italian football tops and shorts. All had 'official merchandise' on them with holograms but we told him that for €8 a piece they were definitely not. They were great quality though. He bought Milan and Juventus tops. They look and feel just the same as his expensive football and cricket official merchandise shirts. We did see one stall selling football gear which was such poor quality it looked like tissue paper. J just laughed and walked on. There were only a few stalls selling ribbon, cottons, small amounts of novelty yarn, small pieces of fabric, buttons, lace trim etc. I may not have had the choice that J had with his football t shirts but I was very happy to have found something creative to bring home. What a nice selection of magazines. I'm glad you've been able to try some patterns. I'd love to go to that market, it sounds really nice.